Designed and built entirely by the members of the Akademische Fliegergruppe Darmstadt in the summer of 1924, the Darmstadt "Mohamed" is a light 'plane of rather ДальшеMore>>> unusual but very clean design. The general lines are fairly well shown in the accompanying scale drawings and photograph. 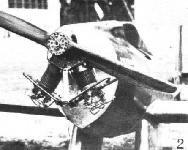 The monoplane wing is very low over the ground, so that a very narrow wheel track suffices, the wing tips being built strong enough to withstand any slight shocks caused by the machine heeling over on the ground. In the photograph the "Mohamed" is shown fitted with a water-cooled engine, but in the actual competition it is likely to be fitted with a British Blackburne "Tomtit." The fuselage is of oval section, and is covered with ply wood. 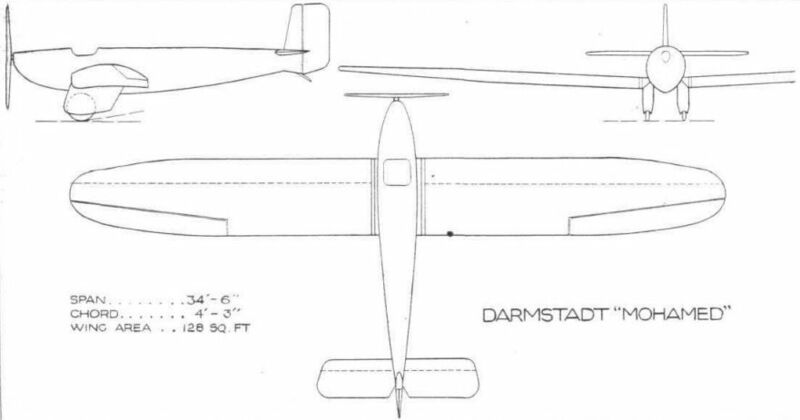 The wing is of the single-spar type, but is provided with three-ply covering over the nose of the wing so as to provide the necessary strength against torsional loads. The undercarriage has its wheels individually mounted with the legs enclosed in "trousers" to reduce head resistance. The lines of the "Mohamed" are exceptionally clean, and considering that the machine has been built entirely by private enterprise, and one might even say by amateurs, it is a most creditable piece of work, and it is to be hoped that it will do well in the competition. The wing span of the "Mohamed" is 10-5 m. (34 ft. 4 ins.) and the fuselage is 4-8 m. (15 ft. 9 ins. long). The total loaded weight of the machine is 250 kg. (550 lbs. ), and a top speed of 120 km. (75 m.p.h.) is expected. 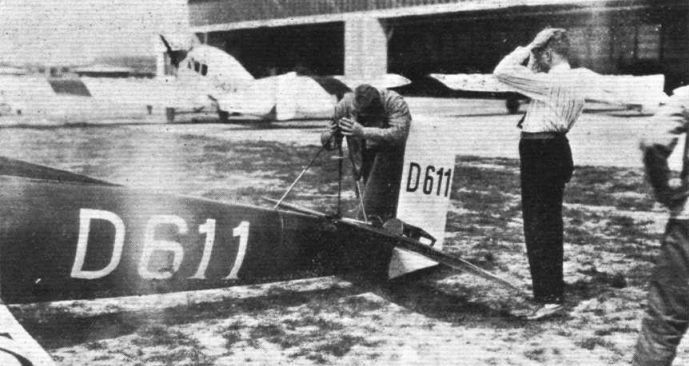 The "Mohamed" of the Akadem, Fliegergruppe, Darmstadt, is a light monoplane in the true sense of the word. In the competition it will probably be fitted with a British Blackburne engine. Boxing the compass: An official taking a bearing for checking the compass of the Darmstadt "Mohamed." SOME OF THE ENGINES IN THE ROUND-GERMANY COMPETITION. The Blackburn "Tomtit," in the Darmstadt "Mohamed."